(NewsUSA) - No one out enjoying time on a boat wants to think about breaking down and needing a tow, but a little preparation can make a big difference. According to the Boat Owners Association of The United States (BoatUS), the number-one reason for a slow or delayed towing company response is the considerable time it sometimes takes for the towboat captain to seek and find the disabled recreational boat on the water. Unlike drivers on a road or highway, many boaters are simply unsure of their exact location. However, the proliferation of cell phones and improvements in cell service over the last decade means that most anyone can use a phone to pinpoint their location and also reach a dispatch center. A phone app, such as the one developed by BoatUS, allows boat owners to pre-program information about their boat. When they use the app to call for help with a dead battery or a tow home, the call goes to the dispatch center and immediately provides the boat's details along with the latitude, longitude, and boater's emergency contact information to the dispatcher, speeding a response. The free app from BoatUS, available at BoatUS.com/app, also provides information about tides, weather, and wind. Boaters without the app can use their phones to call the BoatUS 24/7 Dispatch Center at 1-800-391-4869. 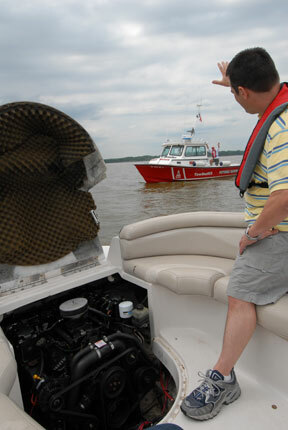 Boat owners can also be proactive and save money by signing up for an on-water towing plan at the start of the season. For example, an annual Unlimited Towing Membership plan from BoatUS starts at $72/year for freshwater and $149 for saltwater. In addition to having a towing service, boaters should be prepared to keep themselves and any passengers safe if their boat is disabled. - Be safe. In life-threatening emergencies, call 911 immediately or use VHF radio channel 16. Know the location of your boat's safety gear and first aid kit. - Be leak-savvy. If you run aground, immediately look for water intrusion and provide a life jacket for each passenger not already wearing one. - Be seen. For safety and visibility in the dark, be sure all of your boat's navigation and anchor lights are working.